The reform to media ownership laws has certainly been a long time coming and a bone of contention with the government. But some, albeit drawn-out, headway has been made. On Wednesday, a deal was agreed with Senator Nick Xenophon whereby in exchange for his support the government has agreed to establish a $60.4 million fund over three years for small and regional news organisations, along with increased training for journalists. The advent of the internet means that the borders have come down for a host of industries, and most certainly the media sector. It literally is a case of kill or be killed, and while the reform will have come too late for Ten, I think we will see a swathe of consolidation once the laws are overhauled. This will create more flexibility for the likes of Fairfax, and also regional players such as Prime could come quickly into the acquisition frame. 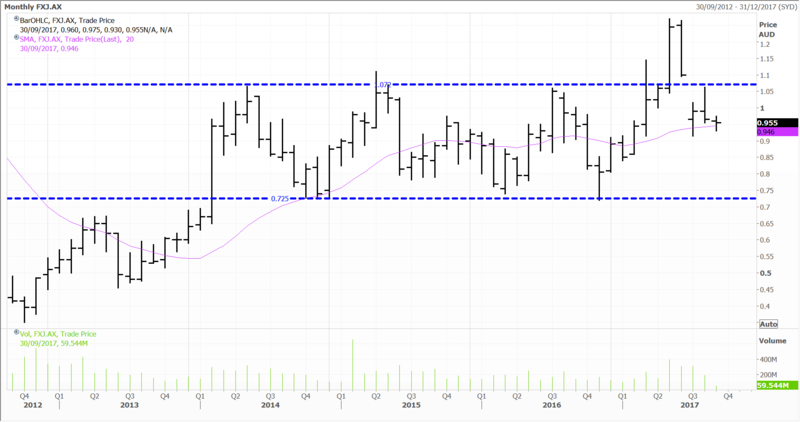 Fairfax failed to sustain the breakout earlier this year after the private equity players effectively withdrew. Investor focus has now turned to the overhaul of the media laws and the demerger of Domain and in specie distribution of ownership to shareholders, which is set to take place in about two months’ time. I think both of these events will result in a rerating of Fairfax. Domain is the second largest player in the online real estate advertising market, second only to REA, with 40% market share in the key markets of Melbourne and Sydney. With the heat coming out of the residential real estate market, the FOMO (fear of missing out) effect is subsiding and listings are set to pick up. This will underpin revenue growth for both Domain and REA. 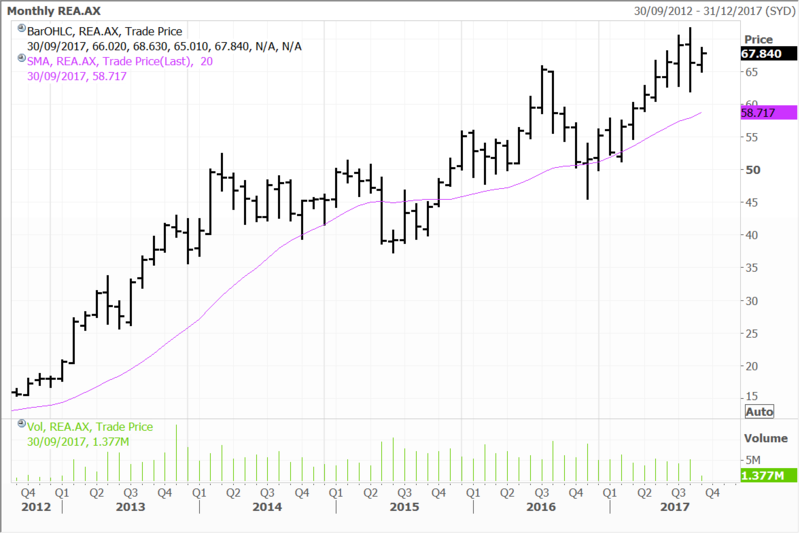 And the market seems to be factoring this in already with the likes of McGrath trading well off its lows and REA close to making new highs – see below. I do not think the market is factoring any of these positive catalysts into Fairfax but the demerger will resolve that quickly. Our substantial position in Macau casino stocks in the Global Contrarian Fund (and other global models) has proven the right ‘bet’ with gaming revenues continuing to surge. The ongoing transition from VIP to the mass market has caught many by surprise, and brokers are now scrambling to increase their target prices and ratings. Shares across the sector were up again on Wednesday, with Wynn Macau and MGM China up 2.5% and 2.4% respectively. Gambling revenue in Macau grew at a robust pace in August, despite the turmoil caused by the powerful Typhoon Halo. August was the 13th consecutive month that gross gaming revenue (GGR) grew year-on-year, firmly snapping an earlier streak of more than two years of declines. Gambling revenue in Macau grew 20.4% year-on-year in August to approximately 22.68 billion (US$2.8 billion) patacas, according to data released by the city’s Gaming Inspection and Coordination Bureau. The sum would have been higher, but for the disruption when the powerful Typhoon Halo that struck Macau on August 23. This led to some hotels and casinos temporarily suspending operations due to damage, power cuts and interrupted water supply. Still, the 20% growth rate was above the downwardly revised consensus estimate of 18% growth. The cumulative tally of 172.02 billion patacas, puts the year-to-date gain at 19.1% at the end of August. We expect the Macau mass-market will continue to grow from current levels. New properties with world-class entertainment and improved transport infrastructure are set to draw punters from a growing pool of Mainland Chinese consumers eager to travel. The Macau casino sector has also benefited from a more family friendly approach. The casual, or so-called mass-market segment, began picking up early in 2016 and the trend strengthened this year. Casino revenues have also been bolstered by a stronger than expected rebound in VIP traffic this year. MGM China is one our core holdings, and has actually been later to the party than some rivals due to the delay in opening its new Cotai property. The group will enjoy some of the spoils of the improving market backdrop when the resort eventually opens, slated for late 2017. It will help the company pick up some market share in the newly reinvigorated Macau gaming market. We hold MGM China in the Fat Prophets Global Contrarian Fund and the Global and Asian Managed Accounts. The expected total development cost is HK$26 billion, excluding land costs and capitalized interest. MGM expects the company to open the MGM COTAI property in 4Q17 and is working with the local government for the necessary inspections and approvals. MGM China’s first half 2017 numbers were decent, with revenues increasing 3.3% year-on-year to HK$7.39 billion. 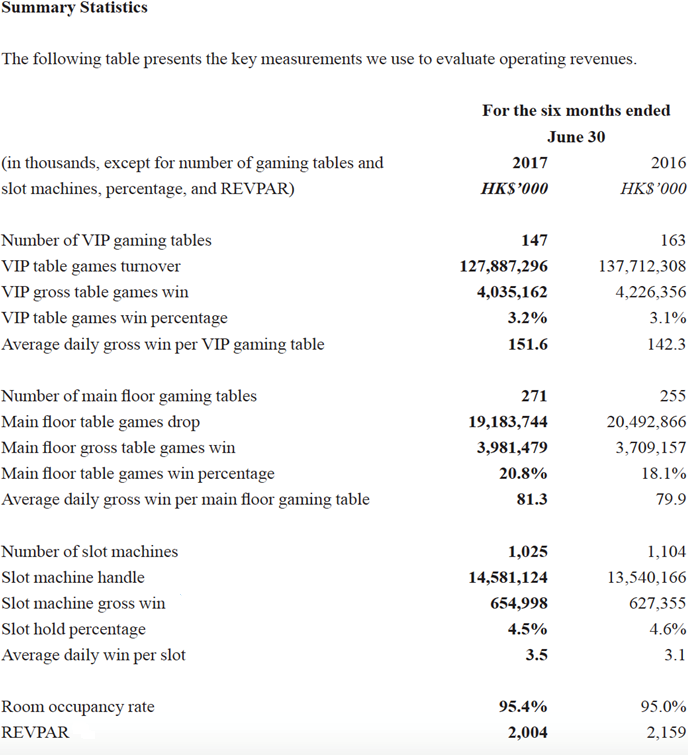 Casino revenue was up 3.5% to HK$7.26 billion, as higher main floor (mass-market) and slot machine win more than offset lower VIP gross table winnings. Commissions and incentives also decreased year-on-year, assisting casino revenue. Adjusted EBITDA in the first six months of 2017 was up 10.6% from the year ago period to HK$2.24 billion. It seems MGM China suffered from its lack of a Cotai presence in the second quarter of 2017 with it losing market share in both the mass market and VIP segments. Visitors are likely being lured to the newer properties that have opened in Cotai over the past couple of years and the opening of MGM Cotai later in the year should see MGM participate in that shift in traffic. MGM has chosen to focus on the mass market, including its future property opening. 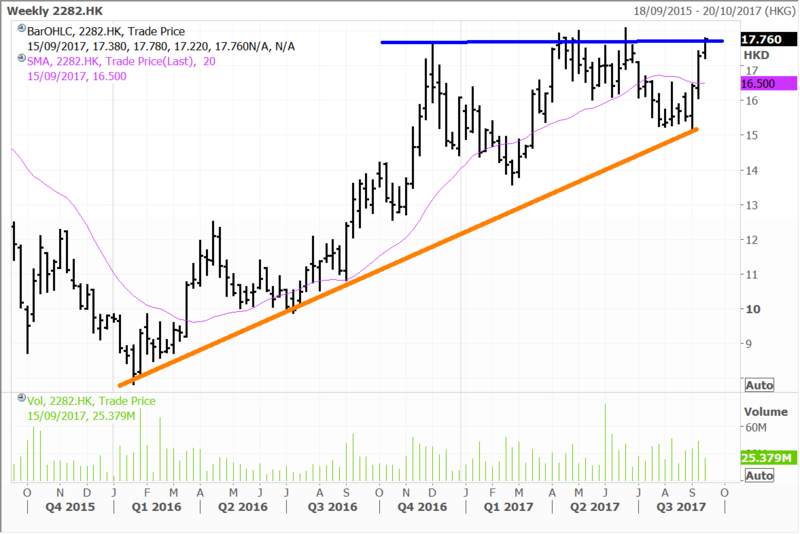 The company may miss out on some of the current traction in the VIP segment but the mass market play is generally more profitable and in our view, has a strong future in Macau. Still, the company is reportedly working with some junket operators to get more VIP traffic back to its Peninsula property later this year. Overall, the backdrop in Macau continues to improve with the bar having been set low given the depth of the prior decline in VIP play. We believe the paradigm shift to mass market consumers, that we expect to occur over the next few years, bodes well for MGM China. MGM China currently trades on an EV/EBITDA multiple of 18.5 times FY17, with this set to decline to 13.0 times in FY18 when the new Cotai property is set to begin contributing. Disclosure: The Fat Prophets Contrarian Fund declares a holding in Fairfax Media, MGM China and Wynn Macau.